In the latest from the Lessons From… series, we look at three valuable takeaways to draw from watching some of the game’s top players try and chase down Rory at his best. 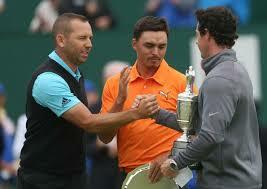 In the end, Rory’s best is about as good as it gets. Immediately after Rory holed his putt to win on the 72nd hole, he sat with ESPN’s Tom Rinaldi and shared about his mental approach throughout the week. It boiled down to two words he kept telling himself before each shot: “process” and “spot”. Process was a reminder to keep his attention focused on his process and his routine, and not on results. This simple word served the huge purpose of helping McIlroy avoid distracting thoughts of his score, how close other players were to him, and everything at stake in what was to Rory the game’s most prestigious championship. Spot was a reminder on the greens to simply pick a spot and let it go. Again, having one simple word works in your favor when we have a tendency to over-complicate the game. In Rory’s words, these were “the only two words I had in my head over the four days, and it worked pretty well.” I’d say it did. The word “compete” comes from the Latin word competere, which is translated “to strive together” or “strive with”. In its purest sense, competition involves two (or more) players striving to perform at their very best – and in the process, bringing out the best in those around them. Competing with a worthy opponent does not require ill will toward them. All throughout Sunday’s final round, and then even more so after the round, Rory’s friendships with his two closest pursuers was evident. McIlroy and his playing partner Rickie Fowler consistently chatted throughout what had to be some of the most pressure-filled moments of each player’s young career. And after the round was over, and both Fowler and Sergio Garcia had fallen just short of catching Rory, the three shared some genuine moments of camaraderie on camera. In the end, it was a perfect illustration of what it means to compete. Starting the day 6 and 7 strokes behind Rory, Fowler and Garcia found a way to perform brilliantly and give themselves a chance at what would’ve been an incredible comeback. 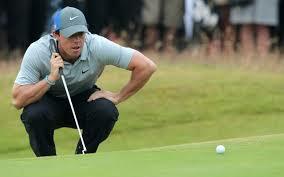 And Rory handled the pressure of playing with such a large lead in a beautiful way. Our best performances are often when we embrace the challenge of a worthy opponent and strive together to bring out each other’s best. Another gem from Rory’s post-round interview was his reaction to Sergio getting to within two strokes of him on the back nine (the closest anyone would get). Rory talked about being aware that Sergio was right there, but needing to “mind his own business” and just play solid golf. We won’t always have the luxury of a big lead late in a tournament, but the strategy’s value remains – stay in your own process, focus on the things you need to do to play well, and mind your own business. For an extended version of Rory’s post-round interview, click here.